I’m not going to talk about the absolute cheapest pool covers money can buy. If your selling your home, or in a situation like that, just head over to Amazon and buy one from Blue Wave. This article is about the buying the cheapest pool covers for above ground and inground pools, while getting the best value. You will learn about inexpensive covers for both inground (lower on page) and above ground (top of page) swimming pools. I will tell you what I know, and direct you to the best place to buy one. I am not only an experienced pool tech with over 29 years in the business, but I am an expert online shopper. If I can’t sell you the same or equivalent product for less, I suggest other stores. If you find any of these items for less elsewhere, please leave me a comment so others can find the same good deal. Above ground pool covers are basically tarps cut to fit the shape of different pool sizes. Some tarps are better than others. There are different thicknesses, colors, strength, grommets, welding overlap, pool overlap, and more. Most if not all come with a cable and crank to secure the cover to the pool. Most people own an above ground pool for an average of 7 years, Whether they move, it collapses, whatever. Average mid-grade pool cover lasts 1-3 years (warranty is for 12 years / lol) and cost $95.00 (24 round). If you run good, you will only replace your cover twice, but it is more likely you will replace your cover three times in 7 years. If you buy the absolute best cover it will likely cost you $130.00, and last you 7-10 years (warranty says 20 / (still liars). So you can spend $190 to $285.00 on 3 cheap covers, or $130.00. This is why the more expensive cover actually cost less. You need the long view of experience. BUT WAIT, THERE’S MORE… With the cheap covers you get the added benefit of exercise, you will be fishing out a bunch of leaves every other year because it tore during the winter. The difference between the best and all the rest is generally like $35.00 – $50.00 of up front cost. Buying a pool cover is a small investment in protecting a much larger one, your pool! The ones I recommend are available for a limited time on our sister site: MightyPools.com/best-above-ground-pool-covers. PRO TIP: If you can not get your pool cover in between your deck and pool, still use the cable and crank for the rest of the cover, and use deck screws through the eye-holes up on the deck. The cheapest way to cover an inground pool is still with a tarp and something like water bags to keep it in place. Most people use water bags, I would highly recommend keeping enough cinder blocks around for the job. Otherwise you will end up with the job of dealing with a slimy box of water bags in the fall. We carry the best you can buy in only the most common sizes on our sister site Mightypools.com/inground-pool-covers. 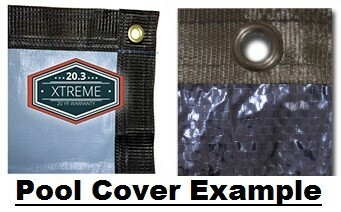 Do your self a favor and buy a good cover. Also take the time to get all the water and debris off of it in the spring. As tough as it can be sometimes to clean the top of the cover before you take it off, it is far harder to clean all the debris and clear your pool water if you let it fall into the pool. Click on the image to get redirected to Amazon where you can buy this automatic submersible pump for just $130.28. PRO TIP: Use your service pole and brush attachment to push the last of the pool water towards the pump, and use a five gallon bucket to remove the the last bits of debris and water. Just a quick word about warranties, for the most part everyone of them is complete bologna. Unless the cover arrives with a bad seam, or is damaged in transit, you have what you paid for, and nobody is going to replace your cover or reimburse you in any way for anything other damage. I speak from experience when I say do not by a pool cover based on a warranty. The one thing a warranty is good for is this. The better covers claim a longer warranty period. I don’t know why the cheaper covers don’t also lie, but weird as it is, if it says 20 years, it is most likely better than the one that says 15 years or 12 years, etc… Even the non prorated warranty portion only covers manufacturer defects (aka split seems). The cheapest pool cover actually cost a little more upfront, but do not have to be replaced as often. This makes the better quality covers much cheaper over any three year period. With pool supplies, you really get what you pay for. My new favor phase is “designed obsolescence”, it means designed to fail at a certain point. In the old days they couldn’t tell how long things would last, so the built them so well they nearly never wore out. Now they know, so they design things to break down a week or two past the warranty. For information on safety covers check out my safety cover reviews page here.